Sabre Fire & Security Ltd are a family run business specialising in fire and safety products. We have a passion for fire safety and strive to be at the forefront of the latest technology available. Specialising in domestic fire suppression, we are the UK & European distributor for Stovetop Firestop®. Sabre can design, supply, install, commission and maintain both conventional and addressable fire alarm systems. Only working with the best manufacturers we offer support and more importantly reliability to ensure you and your property are protected. As recognised suppliers for the NLA (National Landlords Association), we can help landlords understand and comply with the latest legislation. Whether you need a simple domestic smoke alarm or a more sophisticated system we can offer a number of reliable and cost efficient solutions. We can conduct a fire risk assessment at your property to help identify your requirements. Working with the best manufacturers and using only the latest technology we will ensure your property is covered to the highest standards. We can supply a range of mains or battery operated smoke, heat and carbon monoxide alarms. We have access to the latest in wireless technology for domestic installations. If required we also stock fully approved fire blankets and fire extinguishers. Fire suppression systems come in a range of styles – water mist, gas and powder. From large commercial installations to the smaller domestic varieties we can help guide you in the right direction. Sabre Fire is proud to be the UK and European distributors of StoveTop FireStop®, a revolutionary domestic cooker suppression product. With over 50% of all house fires starting in the kitchen StoveTop FireStop® offers a simple and cost effective solution. We offer a range of nurse call systems to suit your needs. Simple conventional to more complex addressable systems we can design, install and commission a system that will ensure your nursing facility is run safely and with ease. Adhering to the latest government requirements and standards we can advise on best practice and also offer the latest in dementia care products. From disabled toilet alarms to PDA induction loop systems, Sabre can help you with making life easier. The kits we offer include everything you need to comply with BS8300 and the Equality/Disability Discrimination Act. Tried and trusted these systems are ideal for use in private and commercial buildings. We design, install, commission and maintain a variety of fire alarm systems. Whether you require a two or four wire conventional system or a more sophisticated addressable system, Sabre can offer you the best and most cost effective solution for your requirements. Our engineers are fully qualified and specifically trained on the systems we install. We only use certified products and unlike some, we offer full manufacturer support for products supplied. Wireless alerting works brilliantly for a whole range of applications. From lighting up your driveway or garden to controlling home appliances, wireless detection is flexible, portable and automated. With long transmission ranges and options for the system to be automatic or manual, we can even offer a system that will work when mains cabling is an issue. If you need a simple camera or a state of the art intruder system we can tailor a solution that meets your requirements. From design to installation we can provide a solution that will make you feel more secure in your home or protect your business premises. Simply contact us for a friendly chat to discuss your needs. Sabre Fire can offer simple maintenance contracts for domestic and commercial priorities. 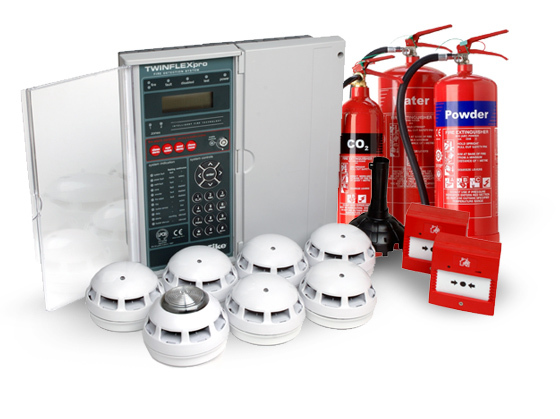 Whether it is a fire alarm system, fire extinguishers or emergency lighting we can help. If you need full certification or simply a refresher course we can offer excellent rates with a variety of manufacturers. Just wanted to say thank you for your help with our fire alarm system. From the moment we contacted Sabre the whole process was pretty simple and Mehran, in particular, was extremely helpful and answered any questions we had. Wouldn't hesitate to recommend Sabre Fire and Security. Hello, thank you for the quick reply and advice given. Really helped me figure out what I needed for my rented accommodation.